Leading local and national researchers and professionals will provide fascinating new insights on the impact of head injury and sport at a seminar taking place in Exeter in May. Organised by local brain injury charity, Headway Devon, the session aims to share the latest research and knowledge in this much-talked about field to encourage safe and responsible participation in sports. 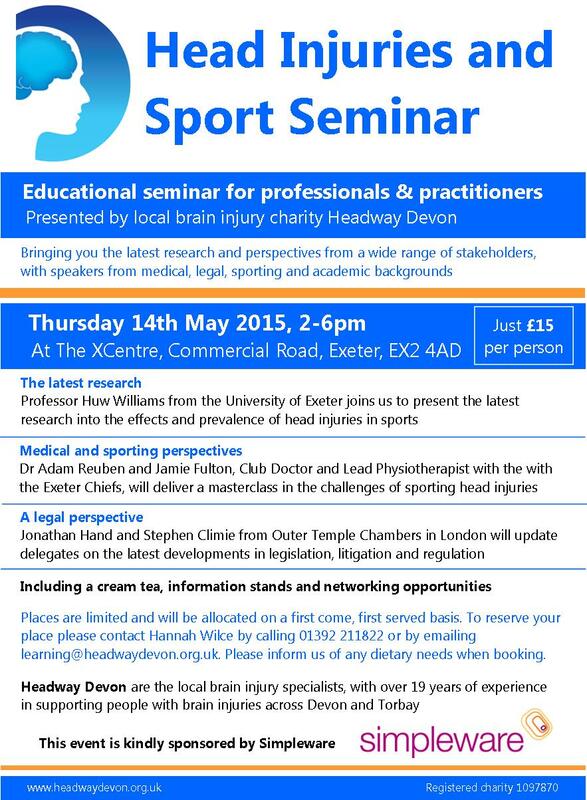 The thought-provoking seminar is designed to appeal to people from all professional backgrounds, giving a comprehensive insight into issues relating to head injury and sport. This event will host guest speakers from legal, medical, and academic spheres. 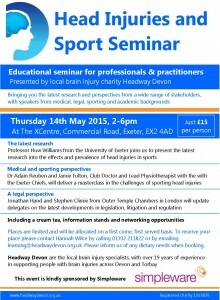 Professor Huw Williams from the University of Exeter will present the latest research, the Club Doctor and Lead Physio from the Exeter Chiefs Rugby Club will provide a masterclass in frontline injury care, and Jonathan Hand and Paul Rogers from Outer Temple Chambers will take delegates through recent developments in legislation, litigation and regulation. The event will take place on Thursday 14th May from 2-6pm at Headway Devon’s office and training centre, the XCentre on Exeter Quay. At just £15 per person, which includes a cream tea and plenty of networking opportunities, this is the perfect opportunity for delegates to boost their skills and knowledge on this topical subject, at the same time as meeting colleagues from a range of related fields and supporting a local charity. This event has been generously sponsored by Exeter-based company Simpleware, who provide software that helps understand head injuries by creating 3D models from scan technology such as MRI and CT.
Headway Devon chief executive Anne Mattock said: “We are delighted to be working with such top rated speakers and our sponsors at Simpleware on this event, which will kick-off a year-long programme of learning events with Headway Devon. For more details, or to book a place, please call Hannah on 01392 211822, email learning@headwaydevon.org.uk or download a booking form here.